On this page you will find some information on a number of demos and programs I wrote for the Amstrad CPC. If you have questions feel free to ask. But be assured that I won't be able to return to the CPC in the near future and that I won't finish any project which I'm said to still be working on - these are just rumours of people who would like to see me coding again on CPC.! On Amiga and Atari ST Chessboard Zoomer were quite a popular effect in Demos. 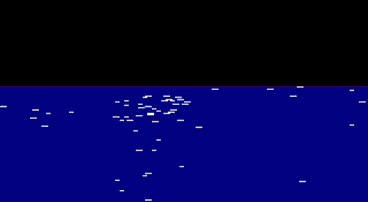 Even on the C64 there were some nice Chessboard Zooming demos, but using the C64 text mode this wasn't such a big thing to do with a decent timing. 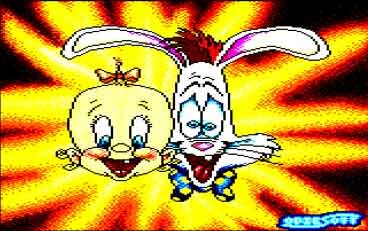 I've seen an effect like this on my brothers' Amiga and I thought it looked really cool. As usual I wanted to port it to the CPC, just to see if it was possible. The Mini Meeting Demo was the only true coproduction of the Hajemara Team (HJT) ever! This was another attempt at creating a natural phenomena on my CPC! The scrolltext in this demo throws a shadow on the ground before it. This shadow is the mirrored text in a pre-calculated parallax scrolling. Unfortunately this demo overexert the power of the small CPC and thus this demo just runs with 25 frames/ second. I had a great interest in creating realistic natural phenomena on my computer. I've spent hours trying to produce decent water-effects like waves, water-drops, mirrored images in the waters' surface, etc. or clouds, rain, fire, growing trees or mountain landscapes and valleys. The introduction sequence of the movie "The Terminator" has facinated me ever since I first saw it. It was always a dream of mine to convert this effect into a CPC demo. 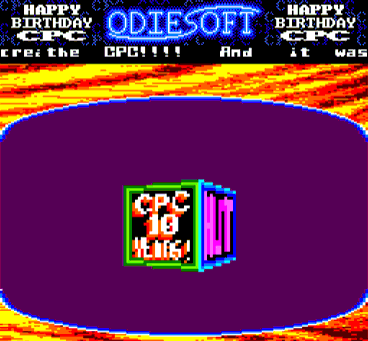 I've created a texture mapping demo for a German Amstrad CPC 10th anniversary demo called Jubilee Joy in 1994. The texture mapping wasn't of course a "real" texture mapping. 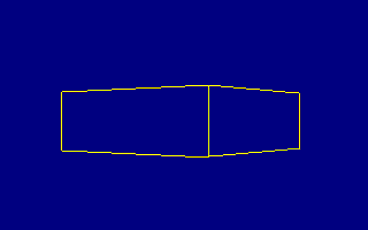 It was precalculated and the cube was only able to rotate around the y-axis, but it was meant to demonstrate that a texture mapping is doable on the CPC. I've seen this effect in an Amiga demo (once again) on the Amiga of my brother. I was really impressed by this idea and the way it was realized on the Amiga. The twisting vertical scrolltext also had a third dimension, i. e. the characters had depth. You were able to see the sides of the letters depending on the way they were twisted. The Wishing Well, which was published as an independent part of the GOS Party 4 Demo turned out to be a big success. I've received letters and comments from many users and most of them had ideas how to improve the program or they wanted me to create a version with more user interaction. Well the story for this demo goes as usual: I saw a similar effect on the Amiga of my brother and I've dragged my brain to figure out a way to convert the filled polygon flag from Amiga to the CPC. The Cebit 92 Demo was compiled by Thriller of GOS, I just participated by creating the perspectively turning stars in the background of the Cebit 92 logo. 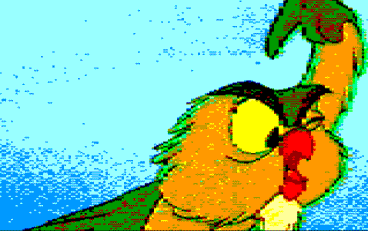 This was one of my first big demo parts and I was pretty proud on it, since it also was one of the first real vector graphic demos on the CPC - as far as I know. I've created this demo in 1990, but it was finally published two years later in the SYSCRASH asc production: "GOS Party 4 - The Revenge Demo" (Side 2, Part 5). When the first Jurassic Park™ movie came out there was a lot of advertisement in the movie theaters, in magazines and on TV. At some point I really started to hate all those commercial. You always saw the same scenes over and over again. This time it wasn't an Amiga demo that triggered the creation of this effect - it was the Super Nintendo Game "Super Castlevania IV"!. A friend of mine had a Super Famicom/ Super Nintendo and lots of games. Super Castlevania IV was one of it. This was supposed to become the final part of a planed Megademo of mine. I was reading the Alien novels at that time and the book to the first Alien movie ended with the last words of Lt. Ripley. I've found that last paragraph impressing and used it as the last text for my Megademo in-spe. When the Acorn Archimedes was announced in 1987 it rocked the homecomputer world! It was assumed, that a computer that was able to animate rendered balls in realtime in BASIC had to conquer the computer market by storm! This was another part for my planned Megademo. It incorporates four different effects. First of all there are the jumping characters of the scrolltext. I had created several different waves for the characters, with a range from a gentle wave to a almost chaotic chaos of opposing characters. This was intended to become the first part of my upcoming Megademo. The basic idea was that this part introduces the users to the whole thing and be used as an appetizer for the stuff to come. Around Christmas 1992 an Amstrad freak with the alias "Shining" organized a party in his basement and I went there with some other freaks from the South of Germany. I remember that we had to drive in the car for a long time to get there, so it was probably somewhere in central Germany, but I don't remember anymore. I've created the first fire effects on my Acorn Risc PC back in 1995. After finishing Megablasters on the CPC I turned a little more to the Risc PC I've bought in 1993 from Leather Rebel, hoping to master this machine in order to create games and demos on this computer as well. At one time I was even planning to release a Risc PC version of Megablasters, but I never started it. This intro is the result of a team effort on the Beng Euromeeting in Wuppertal in 1993. Even though I took part in the demo competition with my Twist Scroller Demo I had some leisure time to write this simple text scrolling intro with the animated skull. This was one of my first finished demo parts! 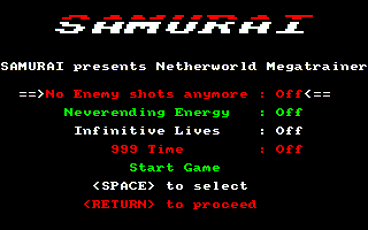 I think that I wrote the "Iron Maiden and Samurai" Intro first and while I was working on this Intro I had the idea for the Mars Intro. Lovebyte often expressed the wish to convert some images from the PC to the CPC and then create a CPC overscan demo with it. Since Lovebyte wasn't this well grounded in programming he asked me to create a program to display these images. Before I became a demo and game programmer I wanted to become famous by cracking games and distributing them with my name attached to them. Together with a friend of mine I wanted to form a cracking team. Since he was a big fan of the rock group "Iron Maiden" he chose this name as his cracker alias. For a long time Cinemaware's "Defender of the Crown" set the standard in computer game graphics on the Amiga. (Gryzor and Renegade were the CPC counterparts for that...). Crittersoap, the son of Marabu wanted me to explain him how to write a demo in Assembler. Every now and then I explained him some methods and routines in Z80 Assembler. While I was browsing through some old 5 ¼" discs I accidentally discovered this slide show I once compiled. I didn't remember creating it and was pleasantly surprised to find these images stored on one of these old discs. Before I created the Flag Demo that was released in the Castle Party Demo I tried to create a polygon flag using a line routine I had developed. After an unsuccessful first attempt at a CPC Megademo I started to create the parts for a second try in 1995. I intended to create a demo that uses mostly unprecedented software effects paired with a few good hardware effects as necessary. On this page I have collected a number of effects and small programs that I have created over several years. Actually most of them were created while I was still learning how to program the CPC - so don't expect too much of these effects. At the end of the eighties and the the early nineties vector graphics and especially filled polygons became more and more popular. It became a necessity to learn how to create polygons if you wanted to stay on top of the demo scene. In 1994 I ordered a CPC+ from a mail order house in Great Britain. I wanted to see what this new kind of CPC was able to do. If you want to stay in business in the demo scene you always had to come up with new effects, cool graphics and great demos. So I often spent a great deal of time to come up with new ideas or to think about how I could convert an idea from some other computer (mostly Amiga or PC) to the CPC.